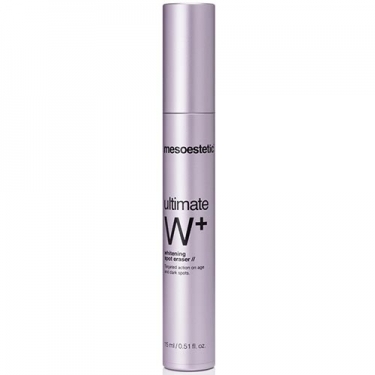 Exerts antioxidant and depigmenting action. 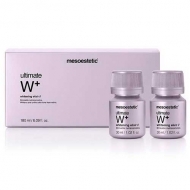 DESCRIPTION: Ultimate W+ Whitening Spot Eraser from Mesoestetic is an ultra-concentrated whitening treatment indicated to act locally on hyperpigmentations of the face, neck, neckline and hands. 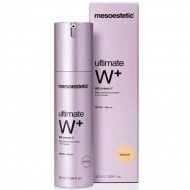 The [meso] white complex attenuates and progressively eliminates the intensity and size of dark spots. At the same time, it exerts a keratolytic action in order to uniform the skin tone. Its format with applicator allows the precise distribution of the product. Press gently to extract the product; Apply morning and evening, directly in the area to be treated, through gentle circular massage until completely absorbed.